Shooting Challenge: Action Shots... 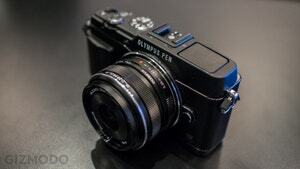 Win An Olympus PEN E-P5 Camera! Pull out your best action shots for this week! Over four weeks, we will hold four rounds — one per week. There will be one Olympus PEN E-P5 prize pack up for grabs every two weeks. This time, we're back to reader's choice for the best entry! Submit your images and we'll hold reader voting rounds for your favourites. Two finalists will go before the Gizmodo Editors for judging, and we will ultimately pick the winner. Entries for the Shooting Challenge — Action Shots will close at 10am AEST on Thursday 1 August. Voting will open for the Action Shots Challenge at 11am AEST on Thursday 1 August and close at 9am on Thursday 8 August. "Action Shots" round winners will be announced at 10am AEST on Thursday 8 August. We have altered the terms and conditions [PDF] for the Shooting Challenge. Linking friends from your social networks to the Gizmodo voting page is encouraged, however, the use of vote farming sites is against the rules and those caught will be disqualified. Please be respectful and constructive if leaving a comment about a photo. Photos need to be taken the week of the contest (July 27-August 1). No portfolio shots please. Save your files as JPGs, and use a FirstnameLastnameAction.jpg naming convention.